1. Location: So much to see, all reachable from the inn. The hub and spoke approach was excellent with so many villages all reachable for a visit. Staying for 6 nights was a perfect combo, enabling us to reach at least 20 towns, without ever duplicating any terrain. 2. Hospitality: Neil and Nat were excellent hosts. They provided restaurant suggestions, great conversation, snacks and beers, laundry, and tons of local knowledge. It was also fun to hang out with another guest couple from Cambridge. 3. 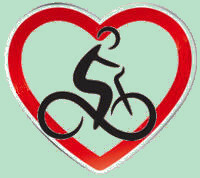 Biking: As hard or easy, short or long as desired. Neil has encyclopedic knowledge of every twist and turn, every bike path and intersection in the region. Incredibly, all this knowledge comes with you in the form of easy to use, clear as day, Garmin GPS device. Once we selected one of the 60+ pre-mapped routes from Neil's catalog, or ask him to combine any number of choices, the instructions were loaded onto the Garmin, and we were off. The amazing part is that it all actually works as designed. It is nearly impossible to get lost, and that is a very high bar for me to say that. 4. Equipment: Bikes were in great condition. They shifted very easily, even on the steep stuff. Great brakes. Neil fitted our saddles and peddles and made adjustments to make the bike fit like ours at home. The bikes are solid and a bit heavier than we were used to, but in the end, they were super stable and we felt in control and always safe riding. 5. Food: Breakfast each morning provided a nice variety of continental fare, replete with fresh fruit, cereal, many jams and pastries, coffee and tea. Dinner, which we enjoyed three times were superbly prepared three course feasts, prefaced by a wide selection of cocktails. Neil is a self-taught master chef, who cranks out meals that highlighted local French fare, with a homemade twist. Excellent soups/first course, entrées, and desserts (featuring Neil's internationally famous miracle sauce), in the style of a typical Provence Prix Fixe meal. On the alternate evenings when we were on our own, Neil directed us to several excellent restaurants that were exactly as excellent as he described. 6. Room: The house has exterior walls that are about 0,5 Meter thick, which makes for great temperature. We stayed in the larger room with a Queen sized bed and large private bath. It was very spacious and with windows open at night, we had a great through breeze. There is also a heater and fan provided. 7. Tips: Neil provided a laminated card with the day's route and tips of what to do or see/where good restaurants are at each town we stopped in. Neil provided excellent info about virtually anything we were interested in seeing or learning about. Overall, our hosts were like our personal concierge who ensured we saw what we wanted to see, and were routed the "best" way for us. It's been a very long time since we had such an excellent experience, having it all go right. 8. Weather: Neil can apparently control the weather too, even arranging for it to rain only at night, flouting forecasts to the contrary, providing clear skies during the day. Room Tip: Ensuite Cabrieres was very large, and only a few E more than the other offered. Eric - US - Oct 14. Fantastic Week at Provence Cycling Holidays! Based in this lovely B&B in Coustellet, we enjoyed a holiday of sight-seeing, gentle cycling, rather hillier cycling - and my dream of pedalling up Mont Ventoux. We chose from Neil's vast selection of self-guided routes which are loaded onto a Garmin. He also produced a tailor-made day tour for us. His local knowledge meant we really made the most of the area. Neil is also an excellent chef; when we got back in the evening we relaxed over dinner with Neil, his family and the other guests - this was one of the unexpected highlights. We'd love to go back! Christine - UK - Sept 14. If you are keen to explore the stunning Luberon Park by bike without the hassle of transporting your gear, then this is undoubtedly the holiday for you. The Cowells have established an excellent base from which to visit vineyards and old villages and ride on wonderfully quiet Provencal roads. The experience is enhanced by so many wonderful features: the farmouse itself, which is a nice place to stay in its own right; owners who have a keen interest in cycling and a fantastic working knowledge of the region; mechanical support for all your cycling trips; and a Garmin GPS facility to get you round without worry. In general, a truly wonderful part of France and a riding holiday made perfect by congenial hosts that showed a genuine interest in our experiences and well-being. Dave - UK - July 14. We had a perfect 8 days stay in July. There were plenty of cycling routes to choose from, we are not very experienced cyclists so it was great to be able to choose how much cycling we wanted to do every day and how much time to spend in the beautiful old villages on the way. You could make it as relaxing or as challenging as you want! The area is stunning, zone A was our favourite with it's crystal clear rivers. Most of the cycling routes are on quite countryside roads going through vineyards and lavender fields. The house was lovely and comfortable and Neil and Nat made us feel like at home. Neil cooked 3 course meal every second day and the food was outstanding. The atmosphere around dinner table was fun and relaxed and it felt like visiting your friends. It really was a shame to go back home..
Magda - UK - July 14. My wife and I had the privilege to stay 5 days with Neil and Nat from July 5 through July 11 in beautiful Provence. The room was large, comfortable and clean. The meals were spectacular. The countryside is lovely, abounding with lavender and sunflower fields, wild flowers and picturesque villages. The food and facilities are impressive, however, the best part of our trip was getting to know Neil his wife, Nat and the other couples staying at the farmhouse and the opportunity to get an up close view of Provencal life. Instead of following a van around from town to town, the farmhouse provides a comfortable base from which to take individually tailored bike trips that can be geared towards either novice or experienced riders.. a truly unique concept. We also took automobile excursions to Pont du Gard and Arles. My wife and I were impressed with Neil's encyclopedic knowledge of the best biking tour routes, gourmet cooking skills, and the individual attention he provided. We had a great experience and would highly recommend Memoires de Provence. Mike and Laurel - US - July 14. My partner and I stayed with Neil, Nat and their family for four nights. They are both excellent hosts. The holiday was unique and one we'll never forget, we could not recommend it highly enough. Self guided cycling was the perfect way to see beautiful Provence at our own pace. Neil has excellent knowledge of the area and offered advice on the best routes, nicest coffee and tastiest restaurants. The picturesque routes through lavender fields could never be found without his detailed and thorough plans. They also create a warm friendly atmosphere with meals on the terrace with other guests every other night. 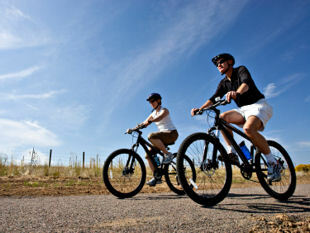 Which is also a great way to share tips with other cyclists and plan routes. The swimming pool is another added bonus after a long day on the road there's nothing nicer than a dip and a cool glass of wine on the terrace. Maeve - Ireland - July 14. While Provence Cycling Holidays is, as the name suggests, especially geared towards cyclists, our group contained two non-cyclists, who had just as marvellous an experience as the two who cycled. Neil's thorough and well-planned self-guided bike tours could easily be adapted for car travel. Before each excursion, we received a detailed briefing on road/trail conditions. Because Neil and Natalene know the area well, they have a wealth of suggestions for points interest to suit all tastes. Their input ensured that we could see and do all we had hoped in Provence under ideal circumstances. Based on our sight-seeing goals, Neil kindly created customized routes by bike and car in addition to the more than 60 mapped routes he offers. Dinner at the B&B every other night was relaxed and convivial, providing an opportunity to get to know our fellow guests. Neil is a gifted chef. The accommodation was spotlessly clean and comfortable, with great attention to little, thoughtful touches that make guests feel at home. Insultingly pretty hilltop villages, peaceful stone abbeys, fields of lavender in bloom, the round of local markets, leafy town squares, Roman ruins, wine tasting in Gigondas, Vaqueyras, Beaumes de Venise, the magical sound-and-light show at Les Baux: unforgettable. A week was far too short in a place where you could spend a lifetime. Neil and Natalene, Lucie, Jamie and Rocket (Roquette?) - we cannot thank you enough for a perfect introduction to beautiful Provence. Room Tip: Some rooms have bathrooms en suite and others share a bathroom. Sandy - US - June 14. What a delightful vacation! We were looking for a chance to get an authentic feel for Provence while having an active and varied experience in the region. My husband and I could not have had a better experience than our stay with Neil, Nat and their lovely children. There were other couples staying there, too, and the easy warmth that resulted from the charming hosting by this family was extraordinary. Each morning we started our days out on the patio for "breaky" with fresh croissants, hot coffee and fruit from the garden. The conversation was warm and jovial, the expert knowledge of the area shared with such enthusiasm and the excellent bike equipment complete with very accurate GPS self-guided routes to enjoy in a self-paced way was just perfection. We leisurely rode through small villages, cherry orchards, along cool rivers and lavender fields. There were over 60 routes to choose from and Neil did an excellent job of recommending a route perfect for your preferences. We could go at our own pace and came home to a lovely welcome, a cool drink and the charm of a lovely family. This is the way to see Provence in all of it's glory. Conversation at the table was a welcome opportunity to share the adventures of the day over a gourmet meal. You can travel the world over and see incredible beauty but it will always be the kindness and the warmth of the people you meet along the way that will will stay in your heart and mind long after the mind's eye can remember the scenery. 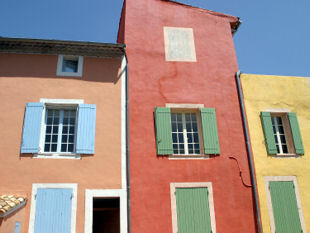 Visit this family...share it with loved ones and enjoy Provence! Sabina - US - June 14.
lucykitty and other reviewers have really said it all! A really excellent holiday. Neil and Nat give a great welcome and great food. They are the perfect hosts. Easy to add your own extra such as sundowners and nibbles on return from a day out cycling in the most beautiful part of France. Local restaurants that Neil recommends are very good. L'Estellan, Gouin (the wine list is the cellar) and Bartavelle were noteworthy. We bought our own pedals and saddles which Neil fitted without any problems. Neil will give you personalised routes if you tell him where you want to go and will also sort out specialized bikes if you wish to climb Mont Ventoux. Fabulous Neil and Nat....thank you. David - UK - May 14. After reading the most recent reviews, I'm not sure I can add to what others have said and I agree with all of them. We stayed here for 7 nights and biked for 5 days. I've gone on other bike trips and Memoires de Provence is a favorite. Why? 1. The owners: Neil and Nat, the are wonderful. B&B hosts can really make the difference in your experience. They are great, friendly, engaging, lovely people. 2. Directions: The GPS provided have your day's route programmed in, meaning you can enjoy the ride without consulting a map all the time. We never got lost. We did make a wrong turn here and there but were notified immediately with the GPSs and were able to get back on course in no time. It was stress-free biking. 3. Flexibility: As others have stated, you can decide how far you want to go and where - and off you go. Each day was different depending on the weather, how we felt, what there was to do in each town. 4. Routes: We never biked on the same road except when you got close to the B&B, and the routes were great - small roads, bike paths, etc. BTW, the French drivers were quite considerate. 5. The Bikes: They are 24 speed hybrid, which I liked much better than mine at home. The gearing was perfect, even up some of the steeper hills, I never used my lowest gear. 6. Tourist information: Neil provides additional information on the towns you visit on a card you take with you. 7. Meals: Dinners are provided every other night which is a great way to get to know Neil and Nat and the other people staying at the B&B. Neil is an excellent chef. He was able to provide tasty meals for us. 8. Laundry. They do laundry daily which we used on a couple of days since we only packed a carryon for our 15 day vacation. 9. The pool - so satisfying after a day on the bike. I was a little concern when I first book this trip about Coustellet, where the B&B is located. It is true the Coustellet isn't a beautiful hilltop town like the ones you'll be visiting on your bike. But it had the Sunday best market, nice restaurants, deli and bakery, grocery store and ATM. And it's a great location for biking because it central to lots of towns you want to bike to and it's nice to start and end your day on the flats. I would highly recommend Memoires de Provence. Room Tip: We stayed in the Cabrieres room. Very big room and big ensuite bath. Windows on opposite walls made for a nice breeze in the evening while sleeping. Dresser and wardrobe provide enough space for your clothes. Ruth - US - May 14. The biking routes we took were magnificent & exactly what we wanted - to ride along quiet country paved roads, visiting hill top villages. Neil helped us chose such routes from his over 60 planned routes. These routes let you chose any distance, sights and hilliness that you want. On our last day we said we wanted to visit two hill towns that we hadn't seen yet & ride there along farmers fields - within 5 minutes, Neil had mapped out another route & loaded it onto our Garmin. The cycling routes we went on for the 6 days were definitely the best cycling routes that we've ever been on over our cycling years. Neil supplies a Garmin which just leads you along the route you've selected for that day. It's very easy to use the Garmin, you never get lost, but it means you can go at your own pace - no need to wait for stragglers or worry about being left behind. Good hybrid bikes are supplied - Neil adjusted the bike for my size in a minute & I liked the bike better than my hybrid at home. My wife normally rides an expensive road bike that she has had extensively adjusted to her needs. Neil made sure she was happy with her supplied bike, ready to tweak the adjustments as needed. He installed her own pedals on that bike as my wife uses cleats. After staying in small French hotel rooms for the remainder of our trip, it was a delight to have our spacious bedroom & bathroom in Neil & Natalene's 17th century farmhouse. Every other night Neil & Natalene provided a very tasty Provence style 3 course meal and drinks. You've got to try Neil's Provence style cocktail! Everything is locally grown - while we were there we saw local growers bringing in bunches of just picked leaks and strawberries. Neil & Natalene are just great hosts - eager to help you have a fantastic holiday. In addition the chances are that the other guests in the farmhouse will be very interesting to dine & even cycle a little with. We were from the west coast of Canada, there was another couple from the east coast U.S., the others from New Zealand & the UK. Our ages ranged from 40 to 70. Our evening dinners together were a delight. Just stay there - you'll have a holiday of a lifetime!! Peter & Ann - Canada - May 14. This area of Provence is simply beautiful and exploring it on a bike, at your own pace, is the best way to see it. As a bit of a head down, ride hard (a relative term) kind of cyclist, I was uncertain about the idea of cruising around the country side but it was revelation. My wife and I had a wonderful week doing just that. Neil's set up is ideal. You stay in the one place so no packing and moving or sticking to a pre-determined route, You wake up and chose the ride you want. Neil makes sure it's all set up in the GPS unit and away you go, just following the arrows and the beeps. This ensures you travel along beautiful country lanes that you could never find in a car. A typical day involves a few stops to wander around the picture perfect towns of Provence and riding makes them much more accessible. You can park your bike in the centre of town, something you struggle to do in a car. The bikes are perfect for the job. Comfortable but not heavy and sluggish, well maintained and enough gears for any of the local hills. So 40 to 50k of riding, turns into a full day of enjoyment. The accommodation is also excellent. Neil and Nat offer a very friendly and inviting home environment in a comfortable traditional farm house. The evening meals they cooked were delicious and it was great to sit around the dinner table having a good old chat. Breakfasts were also great and there is nothing like a few French carbohydrates to fuel the day's ride. The local town, which is an easy ten minute walk away, also provides a very god range of eating options. So all up, our time with Neil and Nat was just wonderful. Roger - Australia - Apr 14. I had a fantastic time here. It was like staying with family. I travelled on my own but was made to feel welcome in every way. Neil has organised the rides and instructions so well. The information cards were great, without them I would have missed out, its the local tips that make the difference. He keeps the bikes in great condition too. Neil, Nat and the family are great! The dinners were great and a lot of fun, I haven't eaten so well for a long time. I am coming back!! Des - Aus - Apr 14.